PREMIUM VINYL: Made from 100% Child-safe Eco-friendly Non-toxic premium vinyl raft material. The Vinyl is 25% thicker and more durable than typical inflatables and completely opaque; Eco-friendly for you and your family. 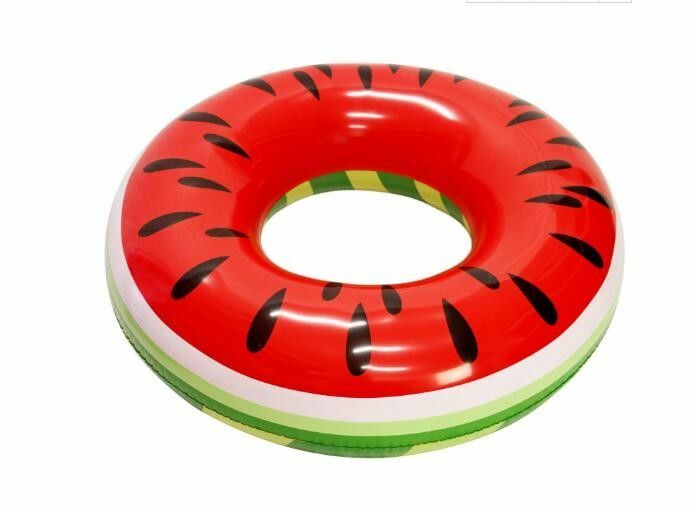 MASSIVE SIZE: 46" x 46" x 10" Watermelon Pool Float, Inner Tube Swim Raft ( Inner Tube: 18" Diameter ). Big hit with the kids, large enough and strong enough for all the adults as well. Perfect for lazy summer days. EASY TO INFLATE: Larger Air Valve for Quicker Inflation and Deflation. It is easily blown up with an air pump or foot pump. No rips or tears. It's held air perfectly through some heavy use. FANTASTIC FUN: Cute Fun Watermelon Design! Who doesn't love a watermelon float? The kids love the style and parents appreciate the quality. What a cool pool toy. Perfect for lounging on the water, getting pulled around by a paddle board or just to use as a swim assist. Phthalate free & EN71 standard ,Low cadmiun lead free . This ring is a toy and is NOT a safety device. Adult supervision required. Yu Xing Industry Co., Limited is a professional inflatable products manufacturer located in Zhejiang province, China. We have our production factory, with rich professional technicians and workers. Strict quality control system from raw materials to finished products ensured to provide high quality inflatable products to you. 6,inflatable furniture,inflatable sofa,inflatable chair,inflatable back support pillow. 7,inflatable medical items and bath toys,Medical bubble mattress,Anti -decubitus mattress. 8,inflatable bathtub.bath book.inflatable water mattress,inflatable bath pillow. We are glad to offer you our best service and will always try out best to meet your satisfaction, look forward to do business with you, thank you.